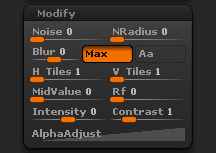 The Alpha>Modify sub-palette allows you to alter the selected alpha in various ways. The Noise slider adds random turbulence to this curve. A value of 0 adds no turbulence; the curve is smooth. The NRadius slider will adjust the scale of the noise being applied to the alpha. With a larger setting the noise radius will be increased that will give a larger scale to the noise. The Blur slider adds a blur effect to the selected Alpha before applying or converting it. Changes to the Blur slider are not reflected in the Alpha’s thumbnail image. The Maximize Range button examines the current Alpha and considers its darkest areas to be completely black, and its lightest areas to be completely white. This effect is accomplished only when applying or converting the Alpha, and is not reflected in the Alpha’s thumbnail image. The Aa will apply an anti-aliasing to the alpha. This will smooth the transition on the alpha. The H Tiles will tile the selected alpha along the horizontal access. The H Tiles can have a different value then the V Tiles to create unique tileable alphas. The V Tiles will tile the selected alpha along the vertical access. The V Tiles can have a different value then the H Tiles to create unique tileable alphas. Mid Value set the zero displacement value. If set to 1, then white is considered zero displacement and all sculpting will push in on the model. If set to 0, then black is considered zero displacement and all sculpting will push out of the model. Setting Mid Value between 0 and 1 allows you to sculpting in and out at the same time. The Radial Fade slider causes this Alpha to blend from full-intensity at its center, to transparent at its edges, in a circular radius. This effect is accomplished only when applying or converting the Alpha, and is not reflected in the Alpha’s thumbnail image. Press the Intensity button to increase the overall value of the selected Alpha. Use Alpha:Make Modified Alpha to bake this change into a new Alpha. Press the Contrast button to increase the overall contrast of the selected alpha. Contrast is a useful way to harden the edges of alphas. The Alpha Adjustment Curve alters the intensity/depth values of the selected alpha, from the values originally defined. The left side of the curve represents the defined portions of the alpha which are darkest (least intensity/depth); the right side represents the defined portions which are lightest (greatest intensity/depth). Changing the curve adjusts these values: moving the curve upward intensifies the values, and moving it downward lessens their intensities.